"My love for henna started from a young age when I loved having henna applied to my hands and would hate it when it faded and disappeared." Kajal began her journey in henna, hair and makeup by qualifying from the AK Academy. Shortly after she joined the AK Agency during which time she has worked on numerous bridal bookings as well as many corporate events (including Asian Wedding Exhibition and Aveda) and travelled on numerous international bookings to amazing destinations such as Florence, Barcelona, Monte Carlo, Santorini and Venice. She has assisted on many high profile bookings including makeup and styling for the Mittal engagement and backstage work at XFactor. Kajal always strives to achieve the highest standard in her work. "Being a part of a bride's big day and making them feel extra special has been a highlight of my journey so far. I am so fortunate to be able to do what I love and share it with others." Kajal is known for her intricate and detailed henna designs, and believes in the power of practice which has helped her be in the position she is in today. “This industry is constantly changing, and am proud to be part of a brand that is leading this change” says Kajal. 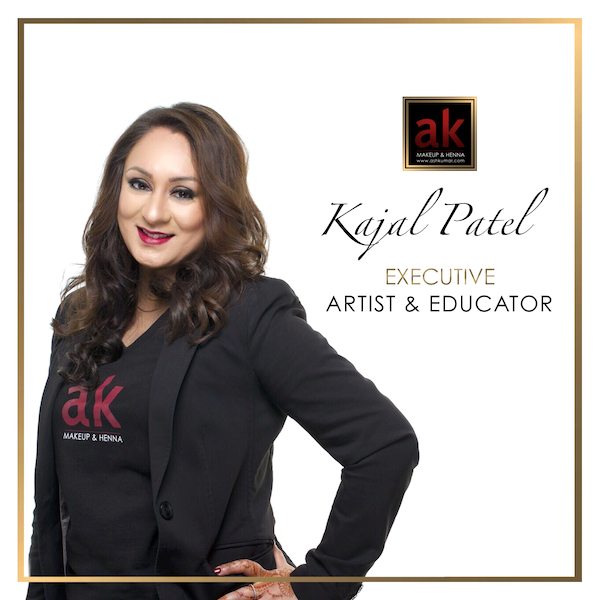 Her passion, commitment and love for the art is evident in her work, and Kajal has worked hard and dedicated her professional practice to the AK brand.